Trust me. I am no expert on this subject. The very thought of writing an article on trust left me cold - to the point where I delayed the deadline for 3 months. My resistance around this subject, however, that told me that this was probably an area worth exploring - both professionally and on a deeply personal level. Trust. Respect. Honesty. These words are banded around so regularly it is easy to loose touch with what they really mean on a day-to-day, moment-to-moment basis. It is how these values play out in our non verbal dialogue with ourselves and others that I am interested in. It’s the subtle moments. The flick of the eyes, the touch of the face, the shift of the feet, the misplaced smile. Monty Roberts Method of Horsemanship - how is it aligned with effective Psychotherapy? As a Psychotherapist with a training background in Hypno-Psychotherapy and NLP, I have always been interested in how these skills overlap with the Monty Roberts method of Horsemanship. 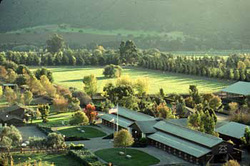 Over the years, I have built a bridge between these two worlds through the practice of Equine Guided Psychotherapy www.humanthroughhorses.com. 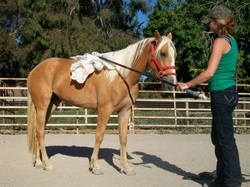 In my view, there are some really fundamental principles that can be applied from the horsemanship world to all forms of people change work from contract setting, meeting the client (human / horse) in the moment and then leading, internal state management, chunking down an outcome, to respecting the robustness of the human or horse. 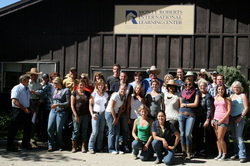 During summer 2010, I had the pleasure of traveling to California to complete a 3 month internship at the Monty Roberts International Learning Centre. This was the final part of my 3 year training to become a Certified Monty Roberts Instructor, which gives me the license to teach Monty's world famous Join-Up method. I went with my good friend, Kata Pataky, who is now a Certified Instructor in Hungary. The farm itself is stunning. There is a real sense of order there which makes for a very peaceful atmosphere. One of the best bits about being at the farm was the fact that they help train rescue horses for free, that would otherwise be sitting bored in pens. This really helps increase their chances of finding a good home. Here is a picture of me helping a horse to get used to plastic bags on a stick. This will help to prepare her for her first rider. I haven't got a rope attached to her - she seems pretty comfortable with the process!